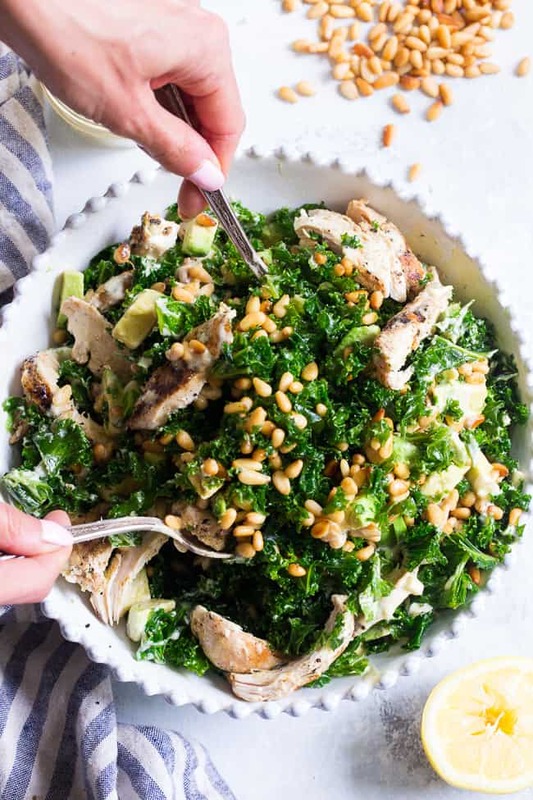 This Paleo and Whole30 Kale Chicken Caesar Salad is an easy, healthy lunch or dinner packed with so much flavor! 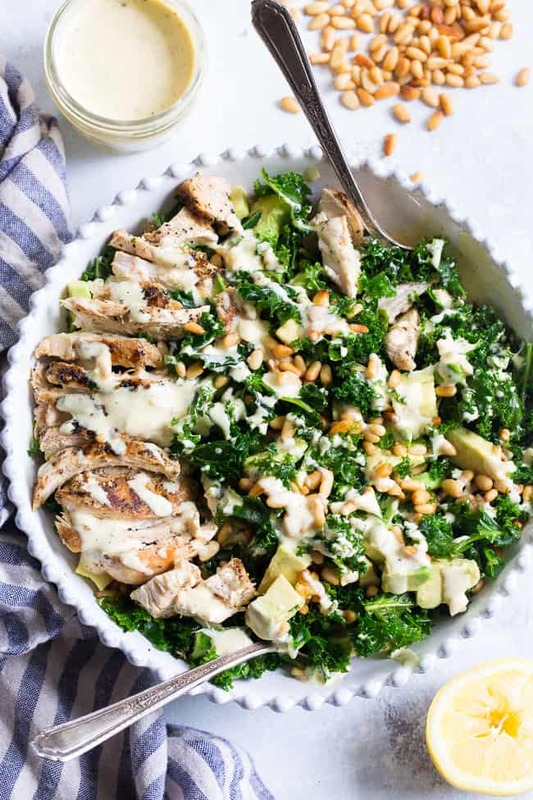 Grilled chicken is tossed with avocado, toasted pine nuts, chopped kale, and a creamy homemade dairy-free caesar dressing for a deliciously savory salad that you’ll want to make again and again. I’m completely into kale salads at the moment, perhaps you’ve noticed. It’s funny, because as much as I LOVE kale, can’t get enough of it, and go through it embarrassingly quickly, I didn’t start making salads with it until very recently. I guess my love for crispy, sauteed kale with bacon, sweet potatoes and eggs made it tough for me to envision it really any other way. And, I guess before I realized how easy it was to massage kale, I was intimidated by its raw texture. Spoiler alert – just a few minutes of massaging your kale turns it from hard and crunchy to softer, almost as if you actually did saute it. Who knew? Anyway, I’d been wanting to make a Caesar salad for awhile, specifically a delicious dairy free caesar dressing. Quite the challenge, if you consider how cheesy your typical Caesar salad is. But, I’m not sure there’s anyone who doesn’t love a classic grilled chicken Caesar salad. Even kids love it, at least in my experience! 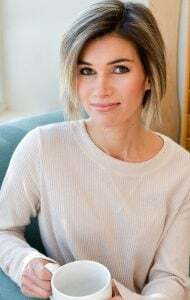 And picky husbands – in fact, it’s the only green salad I’ve ever witnessed my own picky husband order at a restaurant. Okay, maybe there was a wedge salad in there at some point, yes, I’m pretty sure. But still, chicken Caesar salad is high up there on everyone’s favorite salads list. At least among the people who have a favorite salads list, of course. More about this salad now though! 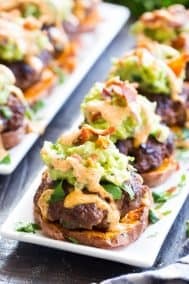 I was thoughtful about what add-ins I used here, because keeping it Whole30 as well as paleo means we’re not recreating croutons here. Instead of croutons though (because I’m sorta over croutons at this point), I decided to top my salad with loads of toasted pine nuts and some diced avocado. Toasted pine nuts are just another things I’ve been seriously into lately – they’re sooo tasty! 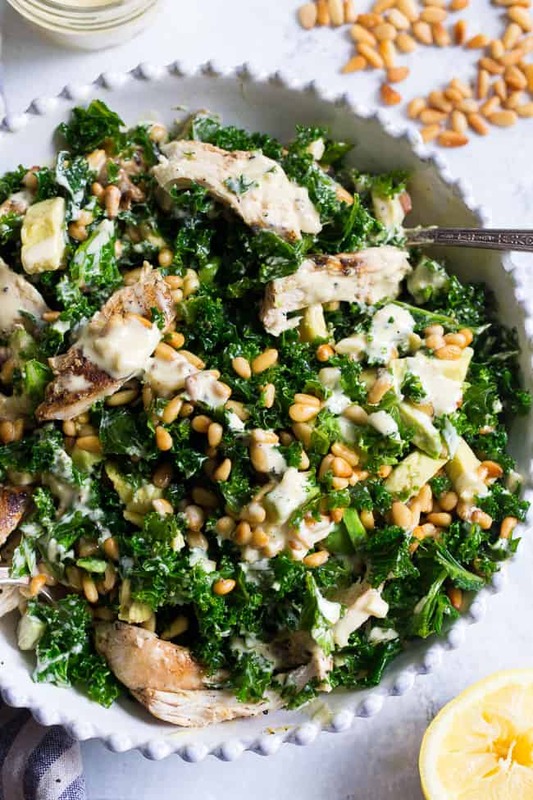 I do realize the avocado and pine nuts aren’t exactly what you’d expect for a chicken Caesar salad, but then again I guess the kale part isn’t either, so I won’t be apologizing after all. Anyhow, there’s just something about the flavor combo in this particular salad that made me swoon. 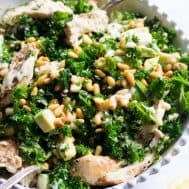 The combination of the toasted pine nuts, grilled chicken and creamy avocado along with the dressing will have all of you swooning over this salad along with me! Now the dressing itself is pretty incredible, and I am super picky about my homemade dressings! 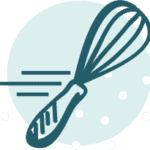 We start with easy homemade mayo (or a paleo friendly store-bought mayo) mixed with lemon juice, coconut aminos, garlic, salt and pepper. It’s just as simple as it sounds! Yes, the coconut aminos/lemon combo had me very skeptical but trust me – this all works out so deliciously in the end! 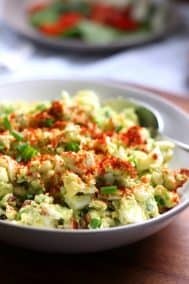 For the absolute best flavor, I really recommend making my homemade mayo recipe as the base for the dressing if you can! From start to finish, this salad is ready in under 20 minutes and makes a perfect weeknight dinner or lunch to go! I hope you’re ready to begin because I’m now officially starving and craving this salad – let’s begin! 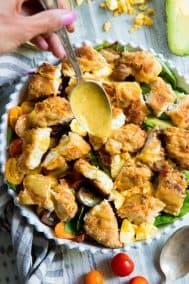 This Paleo and Whole30 Kale Chicken Caesar Salad is an easy, healthy lunch or dinner packed with so much flavor! 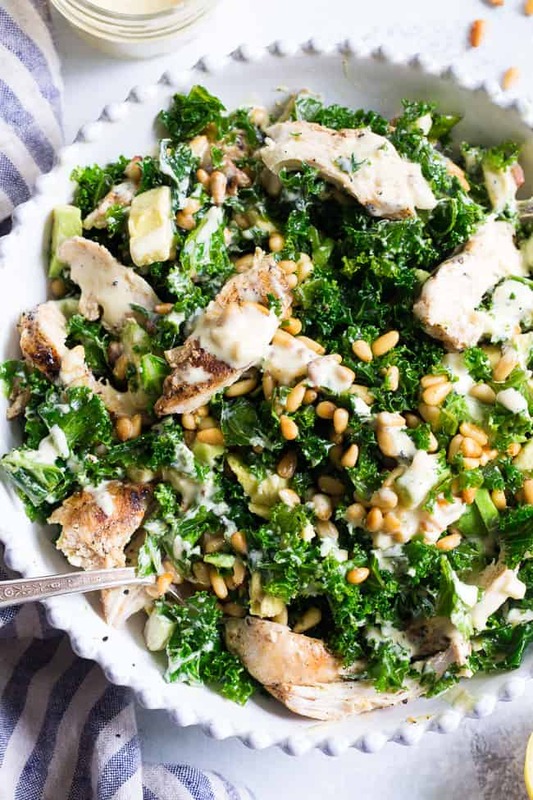 Grilled chicken is tossed with avocado, toasted pine nuts, chopped kale, and a creamy homemade dairy-free caesar dressing for a deliciously savory salad that you'll want to make again and again. Sprinkle chicken breast on both sides with sea salt and pepper, then grill 6-7 mins on each side depending on thickness, until juices run clear and inside is no longer pink. Set aside covered in aluminum foil while you toss the pine nuts. Place a small cast iron skillet over med heat and add tsp oil, the add the pine nuts and sprinkle with salt. Cook, stirring for about 1 minute or until golden brown - be sure to adjust the heat if necessary so they don’t burn. 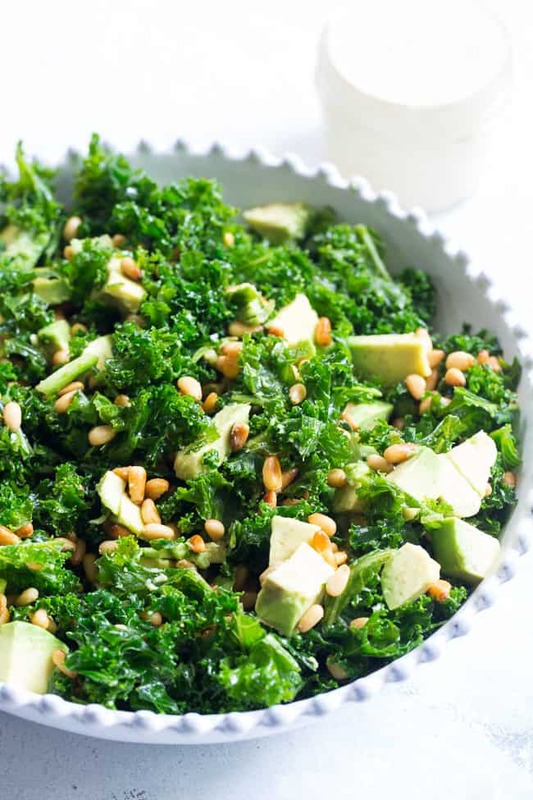 To massage the kale, place it in a large bowl and drizzle with the 1 1/2 tbsp olive oil and sprinkle with sea salt. knead the kale with your hands as if kneading bread dough for about 2-3 mins or until desired texture is achieved. 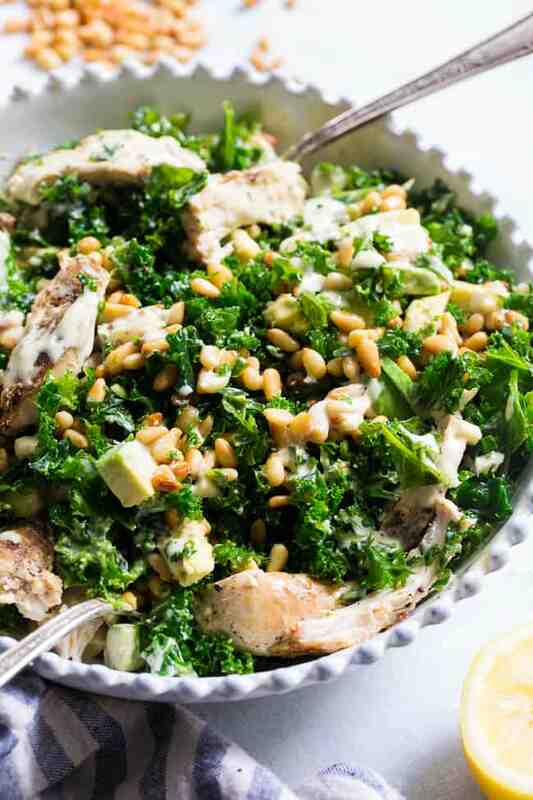 Place massaged kale in a serving bowl snd toss with chopped avocado and toasted pine nuts. 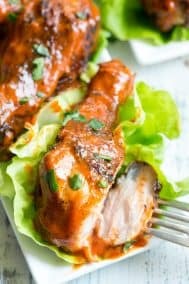 Slice the chicken breast and arrange on salad, then toss or top with caesar dressing right before serving - use as much or as little as you want as per preference. *Nutrition is calculated for 5 servings using all of the dressing (which is more than you need) so using less will alter the calories/fat significantly. 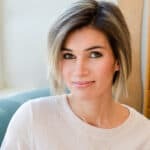 Want More Whole30 Salad Recipes? Try One of These! I made this tonight for my vegetable-hesitant boyfriend and he LOVED IT. He’s been talking about it ever since we finished dinner. 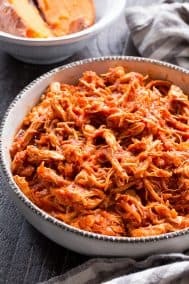 Thanks for another fantastic recipe – you’re my go-to for all things delicious. Kale by itself is so boring, but I love every single recipe with it. Can’t wait to try this one as well. I typically despise both salads and kale, but this is awesome. Simple to make and delicious. I would eat this out of a shoe if I had to. 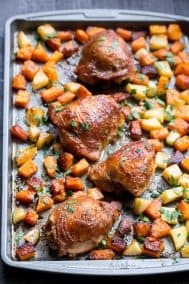 This was seriously so delicious and the best part was it was so easy to make! Delicious! 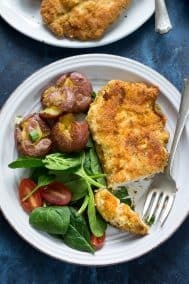 Dressing is super quick to make and has really good flavor. I subbed baby power greens mix for the kale as that’s what I had. Didn’t need to massage or precoat to soften, so will avoid that in future. Oh my Gosh! This was fantastic!!! Even my “must have a starch with every meal” husband loved it! Thank you! Oh that’s so awesome to hear, happy you enjoyed! Just finished this for lunch and I am so impressed. Another winner. 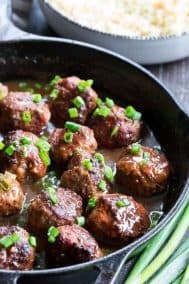 Your recipes truly are some of the best Paleo recipes out there.